not be limited to a narrow approach. " 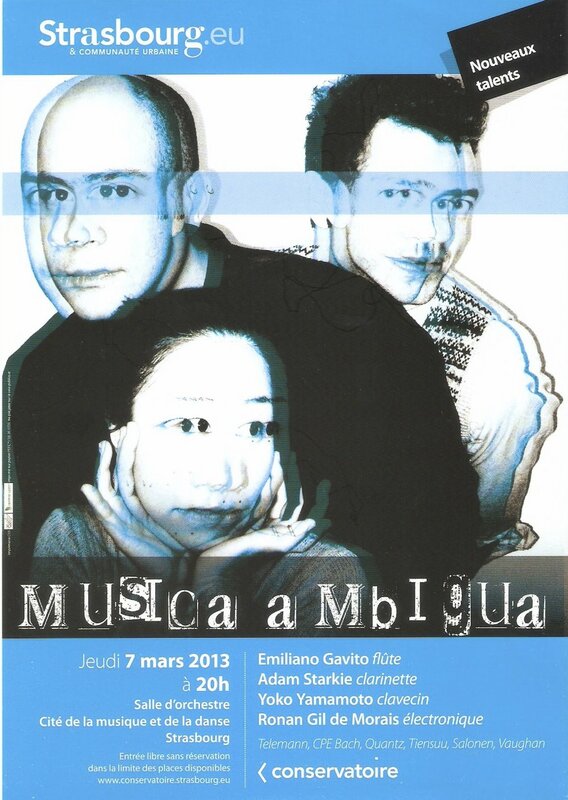 "Musica Ambigua" is an ongoing project in which lovemusic explores the links between contemporary music and early music. These two musical worlds, seemingly opposite to each other, meet here to create a strangely coherent musical idea. The first edition of this project featured works for baroque flute, clarinet and harpsichord with music by Jukka Tiensuu, C.P.E. Bach, Esa-Pekka Salonen, G.F. Telemann, J.J. Quantz and the premiere of a piece by Mike Vaughan for baroque flute, clarinet, harpsichord and electronics commissioned by lovemusic. Since then we have curated two other editions based around the same idea and adapted to the venues in which they are performed. The second version was part of the first edition of the festival Musiques Eclatées in Strasbourg and a third version, subtitled compositeurs d'hier, compositrices d'aujourd'hui (male composer from yesterday, female composers of today) was performed at Saint Maximin in Metz. This project varies in instrumentation and can go from duo (flute and clarinet) to a bigger ensemble (adding harpsichord and/or violin) and adaptable to the venue. For more information about booking this programme and the options available please contact us.